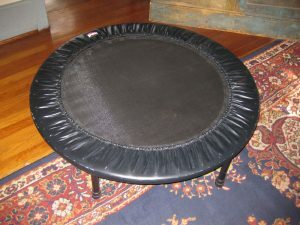 A rebounder or mini-trampoline is useful to get accumulated acids (from exercise or over use) out of the tissues. who are already in pain or report stiffness or soreness, I recommend to NOT gut-it-out with ‘muscle exercise’, but rather to do gentle rebounding instead. After the pain and stiffness resolve, then you can engage in more abusive forms of exercise. The easiest, most convenient, cheap and time-effective, least harmful way to circulate oxygen to your tissue and remove acids is to rebound on a mini-trampoline. Gentle bouncing is effective. A little rebounding often is more effective than one long session. 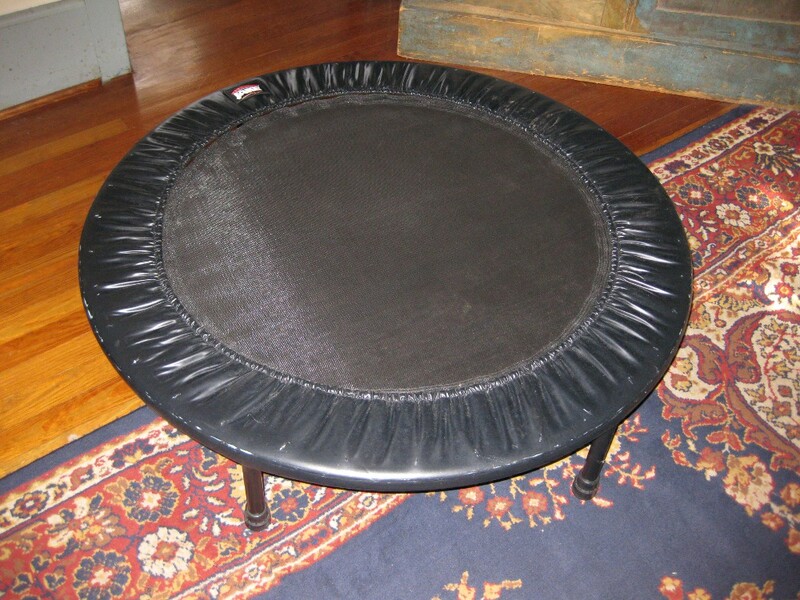 Find a little 3-4-foot diameter 10-12-inch-high exercise trampoline. Gently bounce, and deeply breathe. Your feet should never leave the fabric while rebounding. Now this is important. If you are frail or unstable, have something or someone nearby to hold, or, find the kind of rebounder that has handles. If your joints hurt GENTLE bouncing constitutes less vertical pounding than even walking. THE most important thing to do while gently bouncing is to breath deeply with the bouncing…inhale-2-3-4, exhale-2-3-4 and inhale-2-3-4, exhale-2-3-4. Breathe as deeply as you can. The good news – you only need to do this for 3-4 minutes 2X/day!! You can do it in your jammies, while you watch TV, in the privacy of your own home, on your schedule and not have to drive anywhere to do it and the weather doesn’t matter. If you are able, you can rebound more vigorously but breathe deeply the whole time. 8 minutes a day, max. Once the fluids are moving there is no need to continue on longer. Can you handle that? This will help circulate blood, remove acids in the tissue that make you stiff, and oxygenate your whole body. 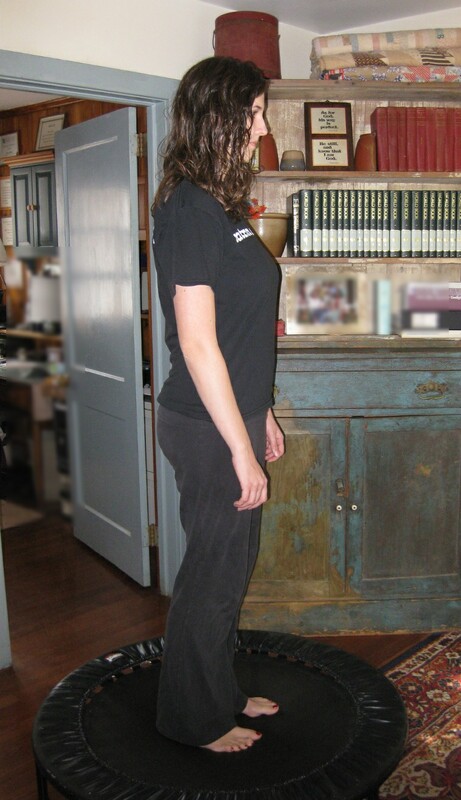 Many people report to me they are less stiff even after 1 minute. Heed the caution given below. Cost: Maybe $20 at Walmart – or check garage sales. Ask around. Lots of folks have these in their attic. Or if you are chronically stiff you can get an exercise version that body builders use at sports stores. Caution: If, after embarking on ANY lymphatic drainage technique, you detect any nausea or flu-like symptoms or abdominal discomfort on the right hand side under the ribs (liver area), STOP and do the Gentle Liver Cleanse for at least a month. This means the lymph you are releasing is very toxic and taxing to your already congested liver. I have seen this many times. Often the body sequesters toxins which the liver had not been able to process. Many things adversely affect the liver (anger, drugs, chronic constipation) and I have also found that those with negative rh factors have lower detoxing capacity. Don’t gut-it-out. Cleanse the liver!! Then pick up where you left off. After you have mastered the above you can increase your lymph drainage by doing the Chapman reflexes using the method described in the Lymph Drainage techniques section. Palpate to identify which points are tender. Find maybe 3-4 of them. Then during your rebounding session, massage these. As the tenderness decreases from these points, find others and continue. Remember the caution above. One month I thought I’d focus on doing all the lymph drainage techniques I knew. That was going to be ‘lymph drainage’ month for me. After 1 week I felt systemically miserable – not better. Why? Because our bodies store toxins in tissue and we are releasing it…all at once when we release the lymph. If our liver capacity is not up to par – well, it will let you know. Systemic misery with flu-like symptoms is almost always liver. So I stopped the lymph drainage and cleansed my liver and then, while continuing the liver support, picked up where I left off…just like I’m suggesting to you. I ‘ve been rebounding for about 9 straight mins a day for the last 15 days and I’ve started feeling pain more on the right kidney side (obliques). I don’t think this is the liver area, it’s a bit more down and to the side. I don’t have any nausea or flu-like symptoms so far. Do you think that the lymph being released can also congest the kidney and I should stop the rebounding? Is it the liver area and I am wrong? Is it a muscle pain? Something else? 1. Have you ever had a pain in this area before this? We normally associate pain with a physical organ, but I have found that more often it is related to an energy stagnation or buildup, and the bladder meridian rules that area you describe. So, whatever the case I would stop for a day or two to see if your symptoms abate as it may be totally unrelated to the rebounding. Then I would only do 2 minutes 2X/day. I think beyond that the benefits diminish. HI. I have just bought a rebounder. I did a gentle bounce on it for the first time but my legs burn. I only go on for about two minutes but feel terrible burning in my leg muscles. Is this normal? I also get a pain in my right knee. Please can you advise me on what to do. This means the lymph is stagnated. You are stirring it up. You may want to read this post and then do Enviro Detox 2B, 2D. Better yet do the Gentle Liver Cleanse for 2 months and then start again. This is not a good omen but you can do something about it. Is there a more natural way of doing the liver cleansing. I am unable to get those things. I was wondering if change of diet would help. Fruit and veggies. Which ones would benefit the liver more. I did a week of juicing from Jason Vale a few month back and I have never felt better. Would going back to juicing do it. Have a blessed day and thank you for your great site. Consult with Jason Vale’s materials regarding liver cleansing. If he doesn’t specify a liver type cleanse then consider doing beets in with your other veggies and add lemon to your juice or drinking water. If you haven’t juiced beets before, it may be good to start slowly. Hi, I have polycystic kidney disease, would using a rebounder help that or make it worse? Rebounding is a very safe form of exercise if it is not overdone. Most people take a ‘no pain, no gain’ approach to any exercise which causes harm. Heed the warnings and use the rebounder only 2-3 minutes at a time, maybe 2X a day. I already have a “Bosu Ball” (www.bosu.com) in the garage and wanted to ask if bouncing on it would work similarly to a small trampoline. It’s trickier to stay on top but this also improves stability and equilibrium. The idea with rebounding is to use as few muscles as possible to ‘shake’ the entire body. The exercise ball you describe is great for many things I’m sure, just be aware of (1)what muscles you need to contract to get the shaking motion. and (2) how much of the body is actually being shaken. With a rebounder you can use the ankles or simply ‘punch the air’ in a vertical manner to move you entire body up and down. Hi, I seen to keep getting sick, and its always after I recover, and start rebounding again. Suggestions? Please help. Thanks. In this post I issue a caution that if your liver is toxic as you start to move lymph, you won’t be able to move debris out of the body. In cases like this consider doing the gentle liver cleanse.